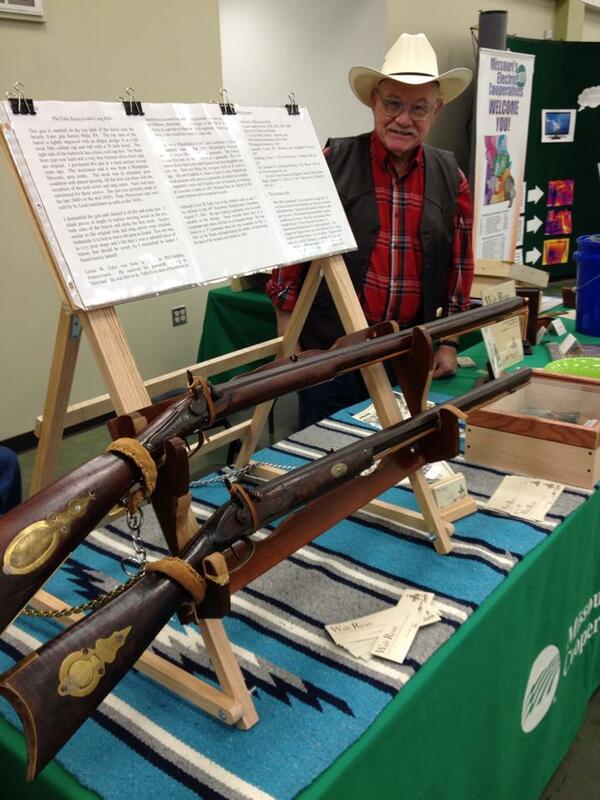 Here is the information from the historic gun display I had at the Missouri State Fair this week. Many thanks to those of you who stopped by my booth and said hello. For those of you at the fair, if you found my book Tales from Clear Creek interesting, here are some blogs I’ve posted in the past about similar adventures. This gun is marked on the top land of the barrel near the breech; Ealer gun factory Phila. PA. The top land of the barrel is lightly engraved with an elliptic design. It is a full stock fifty caliber cap and ball with a 39 inch barrel. The right side of the buttstock has a brass oval cap box. The Buck horn type rear sight and a very fine German silver front sight are original. I purchased this gun at a rural auction several years ago. The auctioneer said it was from a Westphalia Missouri, area estate. The stock was in extremely poor condition with pieces missing. All the iron was there with the exception of the lock screw and tang screw. Nails had been substituted for these screws. The gun was probably made in the late 1840’s to the mid 1850’s. Note: Percussion caps were sold by St. Louis merchants as early as the 1830’s. I dismantled the gun and cleaned it of dirt and scale rust. I inlaid pieces of maple to replace missing wood on the toe, both sides of the breech and along the fore stock. Screws similar to the original lock and tang screws were installed. Ordinarily it is best to leave old guns as found. This one was in very poor shape and I felt that it was a splendid piece of history that should be saved. As I researched its maker I found history indeed! Lewis W. Ealer was born in 1791 in Philadelphia, Pennsylvania. He received his gunsmith training in Maryland. He was first in the Fells Point area of Baltimore in business as a master locksmith and gunsmith. He later moved to Oldtown, Maryland. He had fought in the War of 1812, serving as a private in Hamilton’s rifle regiment, Pennsylvania militia. Ealer would have been 21 years old. He returned to Philadelphia in 1837 and continued to follow the gunsmith trade. The 1839 Philadelphia Business Directory shows his occupation as gunsmith. The Federal Census lists him in 1840 and1850 as a gunsmith. The 1850 census shows that Lewis and Susanna had four daughters and one son. Their son being the youngest child at l8 years of age. The son Franklin A. Ealer is listed in later Federal and local censuses only once as a gunsmith, all others as a retailer. Apparently Lewis and Franklin were in business or working in Lancaster County in 1857 because they are shown in the county business and occupation records. Although Lewis W. Ealer was in his Autumn years at age 71 he enlisted in the 68th Regiment, Pennsylvania Volunteers, August 23, 1862. His gun making experience was no doubt valuable to the military. Some records show him as a Lieutenant and others list him as a Sergeant Major. He was listed as a 1st Lieutenant when he was wounded on July 2, 1863 at the Peach Orchard during the battle of Gettysburg. He died of his wounds on October 6, 1863.